In a recent conversation the subject of laundry came up. I mentioned that I had a washing machine. The response was, Oh, you have a washer and dryer? I said No, just a washer. I got a puzzled look and the question, Well, then, how do you dry your clothes? 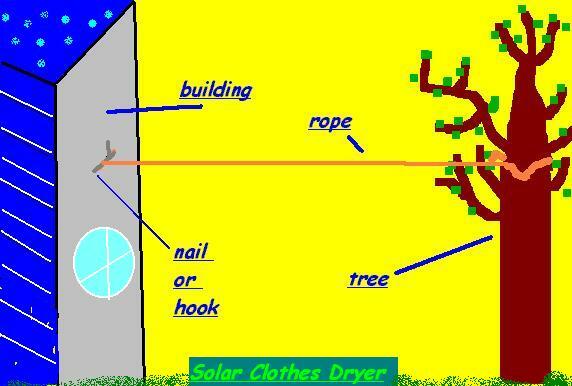 Of course I explained how it was done, and now that I realize that not everyone is aware of this economical and environment-friendly technology, I feel it is my duty to make this knowledge available to the world. The cost of building the device is but a small fraction of the price of even a used clothes dryer. Even more money will be saved over the long term because the SPCD uses no electricity or gas. The energy is free: actually a combination of solar and wind power. The most important item is rope. Wire can also be used, as long as it is protected from rust or other corrosion. You may also need some sturdy hooks or nails. Ideally the SPCD should be outdoors in an area where the sun shines. Survey the area for sturdy vertical objects at least 6 feet high. You need a least two of them. Trees, poles, and buildings work well. The illustration shows a typical installation. The rope should be stretched fairly tight, and suspended just high enough that you can reach it without a ladder. If you live in a windy climate, you may also need some clothespins. Alligator clips or hemostats can be used in a pinch. If space is a problem, hang shirts on clotheshangers. If you hang a sock between each hanger on the line, it will maintain the space between them for faster drying. While the sun is desirable for warmth and a natural disinfectant, moderate wind will also hasten the drying effect. Clothes will even dry on a cloudy, windless day; it just takes longer. Rain, of course, will delay the drying process, but adds an extra rinse with pure, mineral-free water. If you live in a climate where it often rains for several days in a row, you may wish to wash only half your clothes at a time. While new technology may bring wondrous new possibilities to our lives, we must not forget that sometimes the old technology may work just as well with less economic and environmental impact. And it is always important to avoid becoming so dependant on high-tech methods that we forget the old ways altogether.